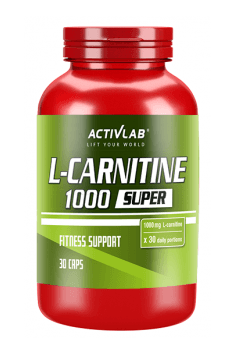 Activlab L-Carnitine 1000 is a dietary supplement contained in capsules, which is a support for people who are both in the process of reducing body weight and in the period of building muscle mass. The preparation is a perfect combination of L-carnitine and L-arginine, which two substances improve training effectiveness and boost energy. This is why it is perfect as a pre- and post-workout supplement. L-carnitine is an organic compound, one of the endogenous amino acids, present primarily in muscles, which is why in Latin it is called caro, which means meat. This compound is synthesized in human body in the liver and kidneys from two exogenous amino acids, which are methionine and lysine. L-carnitine plays many important functions in the organism. For example, it takes part in metabolic processes of fatty acids, carbohydrates and some branched amino acids. What is more, it is also an anti-oxidant and prevents excessive drop of pH in muscles during training. Due to such a broad range of action, it is crucial to maintain correct concentration of L-carnitine in the organism, which may be difficult for athletes, as during effort the level of this substances plummets. Therefore, supplementation is the best solution to this problem, as it can increase the level of this substance in the organism in no time. L-carnitine plays a very significant role in fatty acids metabolism. It would not be possible to derive energy from fatty acids with long carbon chain (>12 carbon atoms) without this substance. Such particles cannot penetrate mitochondrial membrane. This is where L-carnitine helps, as it binds to a fat particle and then transports it into mitochondrion, where beta-oxidation of fatty acids takes place. It is worth noting that beta-oxidation is a far more efficient source of high-energy compounds, than regular glycolysis. Optimization of the process of obtaining energy from fatty acids enables faster and more effective use of fatty acids as a source of energy, both those derived from food, as well as those taken from the decomposition of own fat cells. Therefore, high L-carnitine level promotes fat loss and may boost energy levels in people who are in the process of losing weight. L-arginine is a relatively exogenous amino acid, which means that the body is able to synthesise it, however, body’s own production does not cover 100% of systemic needs. Therefore increasing its level may yield many benefits. The easiest way to achieve it is by supplementation. L-arginine is a unique amino acid - it is not a building block for the organism, but it takes part in the urea cycle and supports synthesis of many hormones. However, in terms of training, its most significant function is promotion of nitric oxide synthesis (NO). This substance dilates blood vessels by relaxing musculature, thereby increasing blood flow in the muscles. This phenomenon enables better nutrition of muscles, it also provides more oxygen, which in turn results in improved exercise capacity and faster regeneration - both between sets and after training. Combination of L-arginine and L-carnitine increases efficacy of both substances due to their synergistic action. These amino acids can promote muscle growth, improve insulin metabolism and increase exercise capacity. It is achieved by totally different mechanisms of action, which complement each other. Better exercise capacity is the fruit of excellent nutrition and oxygen supply ensured by L-arginine. However, this effect is also supported by L-carnitine, which improves the ability of the organism to get rid of lactate particles, which are the by-product of metabolic reactions. In addition, L-arginine can also decrease the secretion of lactic acid. Low level and quicker utilisation of this substance enable much better performance and decrease post-workout muscle soreness. Both L-carnitine and L-arginine have a positive impact on tissue sensitivity to insulin, which is called one of the most anabolic body hormones. Studies have also shown that both substances promoted anabolism by boosting growth hormone secretion. This hormone increases volume and number of muscle cells, which promotes muscle mass development. To sum up, Activlab L-Carnitine 1000 is an interesting supplement, which supports the organism in many ways. It provides optimum conditions for the organism to grow, by supporting training performance and hormonal balance. It is also useful in body mass reduction. This is why the preparation can be used at any time and still bring along many benefits. One capsule daily, preferably 30 minutes before exercise. One capsule a day, preferably in the morning on an empty stomach. It is recommended both for advanced athletes and beginners, who have just started broadening their knowledge about supplements. This supplement is also perfect before training, as it improves exercise capacity. When taking this product before workout, it is worth combining it with beta-alanine or caffeine. L-citrulline is also a good choice. Anti-caking agent E470b, acidity regulator - citric acid, capsule (gelatin, E171 dye).